The AO-CLIP is a plastic accessory often used to connect structures together temporarily or to create guides in the assembling process. This clip only has temporary applications. The most common application is using the clip to assemble multiple modules together or to form mega structures that would be difficult to transport in one piece. You could also make better use of your floor space by creating convertible structures like the Flexpipe Crib, for example. We also use it at Flexpipe to build removable tables and to facilitate the transport of small and ergonomic tables. The AO-CLIP is a sturdy piece of plastic which makes it very difficult to remove a pipe or place it inside of the clip without using considerable force. If the area where you need to install the AO-CLIP is narrow or if it is the border of a surface, it is possible to cut one of the ends. However, be aware that doing so will weaken the AO-CLIP's link with the surface. 2- Take a AO-CLIP and position it at the desired location on the surface of your choice. 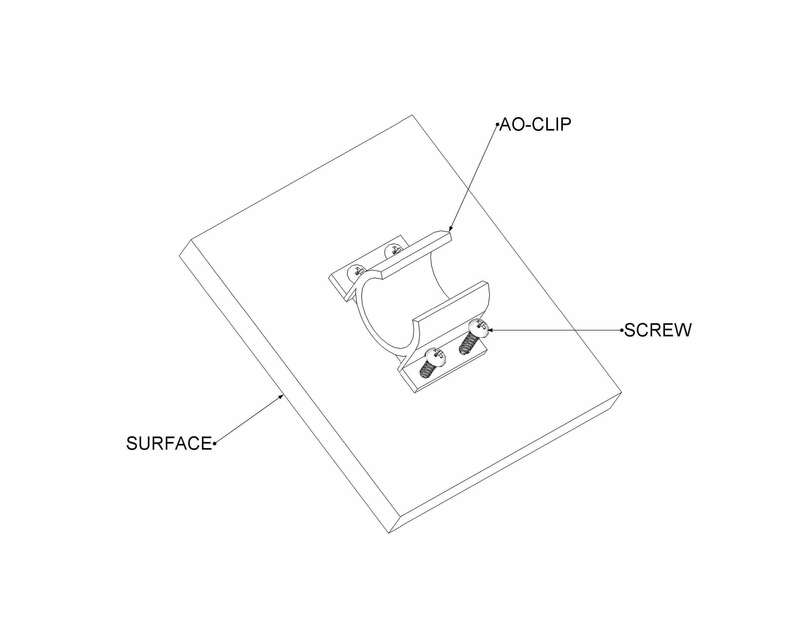 3- Fix the AO-CLIP to the surface with the help of four F-A85/8 screws.